The bowhead gets its name from the strange shape of its mouth. The curves of their lips and jaw are shaped like an archer's bow. 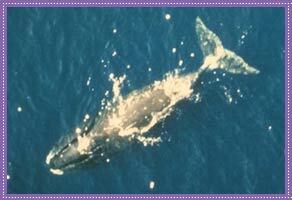 Bowheads are one of only three species of whales that spend all seasons in Arctic waters. They are some of the largest mammals on earth. Full-grown female bowheads grow to fifty or sixty feet long and weigh more than sixty tons. Their bodies are usually bluish-black in color, with sections of white on the lower jaw. Bowheads also have white areas near their flukes or tails that sometimes grow larger with age. Their blubber is often up to two feet thick. Their blunt, triangle-shaped head makes up at least one-third of their body length and could hold a standing, full-grown man. A bowhead's tongue can weigh a ton all by itself. That's more than a mid-sized pick-up truck! But of course, bowheads would never swallow a human, as they get their food from a much smaller source. Think about it: Imagine if your head was one-third of your whole body. Draw a picture of yourself that way. Um, can I get some floss, please? Bowhead whales have baleen, a curtain of fine, overlapping plates they use to capture their food. Their baleen is longer than any other species of whale. Baleen is made of the same type of material as fingernails and hangs from the upper jaw. It is fairly flexible, and becomes thinner as it gets closer to the tongue. When bowhead whales feed, they skim near the surface of the ocean with their mouths' open. The baleen captures plankton and tiny crustaceans like krill and copepods. Although their food is tiny, bowheads consume hefty meals. They can eat two tons of food in a day. Think about it: Some Iñupiat or Yup'ik artists etch landscapes or other Alaska scenes onto baleen using a method called scrimshaw. Others will remove narrow strips from baleen for raw material to weave wonderful baskets. Look for their work at your local museum or gift shop that features Native-made art. Or maybe you're lucky enough to have an artist in your family! 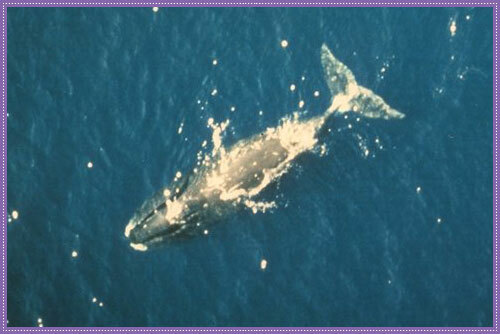 Though they sometimes travel in pods, bowhead whales are generally solitary animals. They usually only travel together to areas where food is plentiful and migrate together only in Arctic waters, depending on the length and frequency of the ice. Bowhead whales use their blunt heads to break through thinner ice and surface when they need air. You wouldn't want to try that at home. They usually dive for five or ten minutes, but if threatened, they can stay under water for close to an hour. When they surface, bowheads spray water from two blowholes on the backs. Bowhead whales communicate with each other and their environment with low moans and calls. They also breach and slap their tails. They are relatively slow swimmers, especially when feeding. After mating, female bowheads can remain pregnant for twelve to sixteen months. Young calves quickly learn to swim only moments after they're born, helped immediately to the surface by their mothers. Calves have thick blubber that gives them warmth in the frigid water and stay with their mothers for a year or more. Think about it: How long did it take you to learn to walk? Researchers still debate the lifespan of the bowhead whale. At first, they thought the animals lived for sixty or seventy years, like many other whales. However, recent evidence has shown that they may live much longer. Scientists discovered ivory harpoon tips in bowhead whales in 1993, 1995, and 1999. Whalers used stone tips over a century ago, so some scientists now believe that certain bowheads may live for more than a hundred years. Commercial whaling is no longer legal in the United States, mostly because bowhead whales were one of several species of whales that neared extinction. Humans hunted them for their blubber, oil, meat, and baleen. Killer whales are bowheads' only other predator. Observing both tradition as well as international regulations, Native Alaskans continue to hunt for bowhead and gray whales in a subsistence hunt. Each village is careful to stay within a quota to not further endanger the species. Image provided by BP Exploration (Alaska) Inc.